I have a ton of cookbooks. The bad thing is I never really use them. That's right I am horrible about using my vast supply of cookbooks. Most of them were either gifts or belonged to my mother. I love looking through them and finding ideas, but I really if ever actually follow a recipe from one. A great deal of it has to do with the fact that I find so many recipes on the Internet. Finding a recipe in a cookbook can involve looking through an index and flipping through multiple books. Most of the time I just want to find something quickly. That's where online recipes are great, I can type in the ingredients or recipe I am thinking of and thousands of recipes appear instantly. There are a few things that I prefer with cookbooks. My mother's handwritten notes and modifications being the biggest. Both my mother and grandmother loved their cookbooks and wrote in the margins with the changes that they made. There is such a sense of history and connection to these notes that they are a big part of the reason I love my cookbook collection. An online recipe can have reviews, but it has far less tangible history linking it to the past. Plus I still love the feel and smell of books. There is something so romantic about standing in the middle of a very old library, it feels perfect to me. During the winter I make a large number of soups and stews. I am always cold in the winter and soups does a great job of warming me up. Last week I tried a new recipe for Butternut Squash Tortilla Soup from the January 2014 issue of Southern Living magazine. This recipe has 10 ingredients. It takes 45 minutes of total time, 25 minutes of which is active and makes 10 cups. I did make a few changes to the original recipe. First, I make my own chicken broth. As I have stated numerous times before I prefer homemade stock since its inexpensive, lower in sodium and tastes better than store bought. Plus it is so easy to make! For the toppings I did not add chicken or tortilla chips. Instead I used cheese and served corn tortillas on the side. The only thing I would change in this recipe would be to use a sweet or yellow onion instead of a red one. The red onion was a little strong, a sweet onion would be perfect. That aside my family liked this recipe. 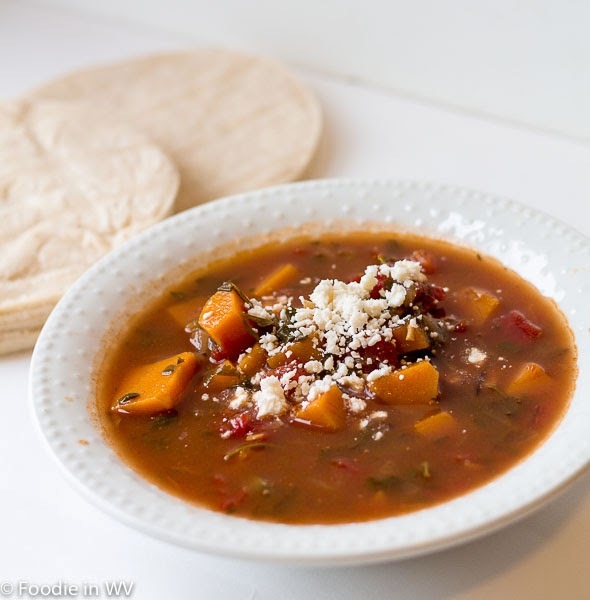 My husband thought it would be better with black beans instead of the squash, he isn't a fan of the current food trend of putting butternut squash in every soup recipe. The soup reheated very well the next day and made enough servings for two meals, which is always nice when following a food budget. For the recipe go to Butternut Squash Tortilla Soup. Sounds super yummy. I need to find this recipe, I love butternut squash. I'm a big fan of butternut squash also, it's delicious! I agree, chunky soups in the winter are great! My husband has decided that it seems to be in everything right now :) I think adding black beans would be nice, plus it would add a lot more protein! I have about 15 cookbooks and don't use one of them. The only recipes I ever use are either the ones my mom wrote out or ones I find online. I love old libraries too. Did you visit any when you were in Europe? We recently went to my most favorite so far in Dublin. No pics permitted, but man, it was nice!! I remember my mom and gram using their cookbooks (and handy dandy recipe card holder), and they wrote in the margins too. It would be a great recipe for Mexican night! I too enjoy warming hearty soups or stews in winter time. This looks fantastic! Thanks :) Soup in the winter is the best! This sounds really interesting. I love tortilla soup! 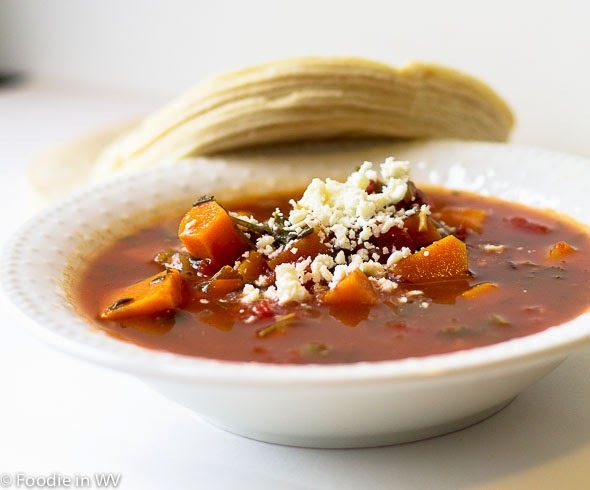 Tortilla soup is one of my favorites also! I am always cold in the winter too :) I don't think that I was made for cold weather! I have a serious cookbook addiction myself, I love looking at all the pics etc! That soup looks yummy and look like the perfect soup for this kind of cold weather we're experiencing. Another one for me to make this year as well. Glad that you are the same way as me :) I have stacks and stacks of cookbooks, that I only look at once or twice a year! This soup is a great cold weather soup, we have been cold this week as well. I'm already ready for spring! I made this yesterday and it turned out really great. I didn't use the pepper, since my 22 month was eating it too. I love butternut squash, so I'm glad to have another soup recipe for it. I often modify ingredients for my kids too :) I'm glad that it turned out well! I love using butternut squash too, it's a great winter squash! I love this Soup! Nice one!!! Thanks, it was easy and delicious!